Kunsthandel Inez Stodel sells rare and wearable antique jewellery that will make the perfect gift or that will be a contribution to your jewellery collection. Inez Stodel, renowned for her extraordinary eye and taste, has specialized in jewels and small works of art for over 50 years. 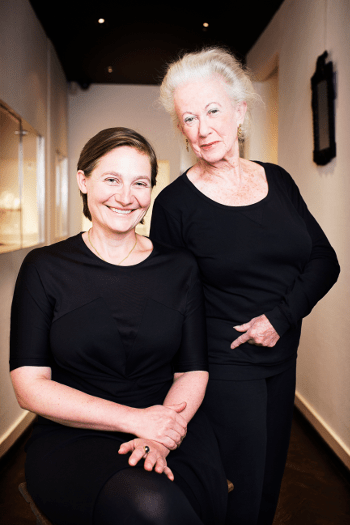 She has been joined in the business by her daughter, Leonore van der Waals. In their shop on the famed Nieuwe Spiegelstraat, you will find a broad collection of elegant and original jewels ranging in date from antiquity to the 1970s. In the collection you will find signed jewels made by grand houses as Cartier, Tiffany & Co., Marcus & Co., Van Cleef & Arpels, Mauboussin and Boucheron, as well as pieces by famous designers as Carlo Giuliano, Alexis Falize, Jean and Georges Fouquet and Seaman Schepps. Besides period jewellery and bijoux de charme you will find objets de vitrine such as boxes, small sculptures, maîtrises, scent bottles, portrait miniatures, costume accessories and micromosaics. Stodel and Van der Waals also build – with great enthusiasm – personal collections upon request. If you are in search of your perfect jewel they will find it for you. In 1964 Inez Stodel opened her Amsterdam shop, designed by architect Jaap Bakema. It was a branch of Stodel en Goudsmit, Rotterdam until she became sole owner in 1971. Inez Stodel Kunsthandel is located in the center of Amsterdam a short walk from the Rijksmuseum. While in past decades the firm participated in many antique fairs, today it focuses on pAn Amsterdam each November. Kunsthandel Inez Stodel is member of the KVHOK, the CINOA and the Spiegelkwartier. Since 2010 Inez Stodel als sells on the online marketplace 1stDibs.